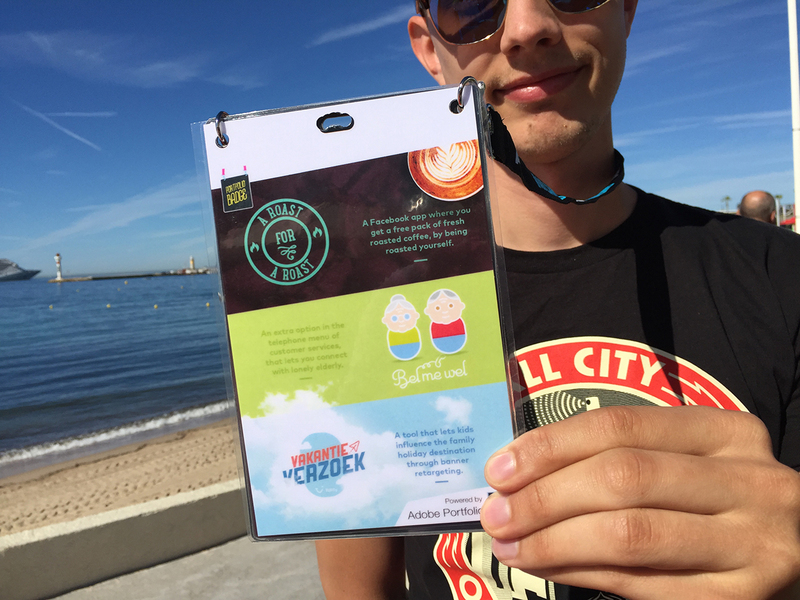 CANNES, France—The back of a conference access pass is generally pretty worthless, except as a place for organizers to sell ads. But what if that space could be used to advertise yourself? That was the idea that led two young Dutch creatives—Mark van der Heijden and Ramin Bahari—to create the Portfolio Badge for attendees at the Cannes Lions International Festival of Creativity. Here's how it works: If you're looking for a job, a client or just a chance to highlight your recent work, you can visit PortfolioBadge.com and download the Adobe Photoshop template created by van der Heijden and Bahari. Then simply drop three visuals from your best work into the template, add a brief description and email the finished product to contact@portfoliobadge.com. 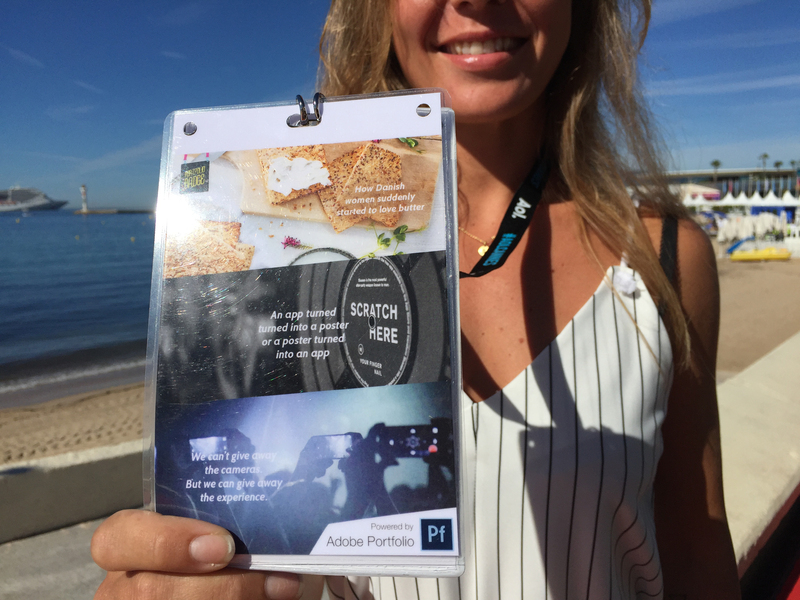 The creative duo behind the idea pitched it to Adobe, which agreed to be an official partner and to distribute the first 100 of the printed Portfolio Badges at the Adobe Cabana in Cannes. 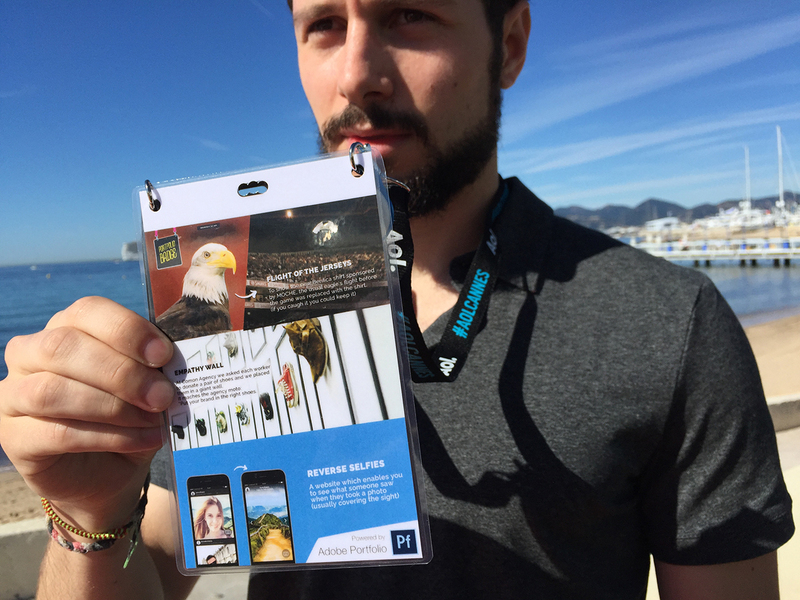 The Portfolio Badge is sized to clip perfectly behind any Cannes Lions pass. "The first thing everybody looks at at the festival is your badge, so we thought we could do something with that. That's why we created the Portfolio Badge," van der Heijden told Adweek. "Then people can actually see your work, and you can let your work do the talking." Flight of the Jerseys: A stunt that replaced soccer team Benfica's iconic stadium-soaring eagle with drones carrying new team shirts sponsored by mobile network Moche. Empathy Wall: As part of Comon's rebranding, it created a wall where each employee donated a pair of shoes to illustrate personal investment in the agency. Reverse Selfies: A promotion idea for Portugal that lets you remove friends from their selfies so you can see more of the beautiful countryside. View his work on Cargo Collective. Bakke Dal butter branding: "How Danish women suddenly started to love butter." Analog Scratch Poster: A poster-app combo for creating classic DJ scratch sounds with your fingernail. The Canon Gig App: Gave users the experience of using a DSLR camera from their smartphones by connecting them to a 4K camera facing a festival stage. View her work on TwentyfiveAndThirty.com. A Roast for a Roast: Connects coffee lovers with small-batch roasted beans in exchange for being roasted on Facebook with insults from the farmers themselves. Bel me Wel: Instead of hold music, elderly residents calling a business's customer service are connected with a real person who will talk to them until their wait time is over. Vakanti Veazoek: A tool that helps kids encourage their parents' vacation planning by turning their favorite destinations into retargeted ads seen only by residents of the home. View his work on NietBang.com. Portfolio Badge creators Mark van der Heijden (left) and Ramin Bahari.